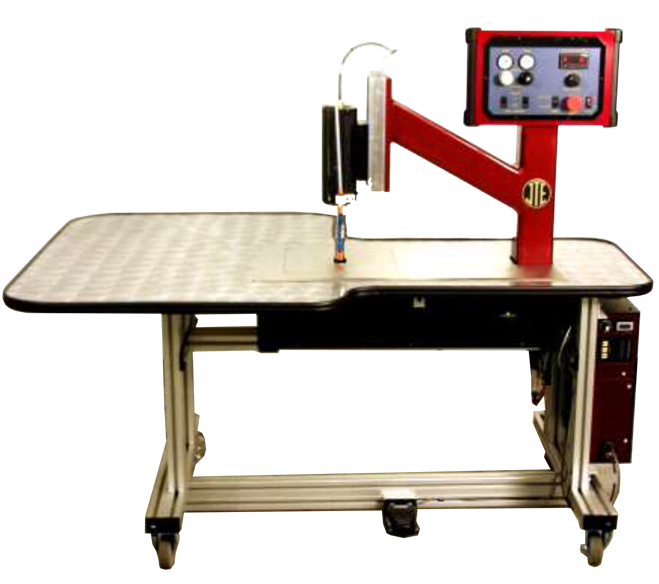 The JTE Rotary Sonic Welder is a dual wheel, ultrasonic sewing system ideal for welding and trimming polyester flags, banners, and signs. It requires no seaming tape, and is as easy as a sewing machine to operate! As it welds, it trims away the excess material, allowing for a finished and professional look, while eliminating the potential of fraying. It is great for hems on window screen graphics and tradeshow graphics, in addition to welding block out material and Tyvek. The top mounted “horn” with side by side welding and cutting anvils, allows for versatility and two different pressures for welding and cutting. Complete with integrated standard or custom table, foot-pedal control. and custom cooling system, welding and cutting thermal plastic material has never been more controllable and simple to operate! A 1200 watt, 20k, 120V single phase generator is at the heart of this system, complete with advanced Energy Control for consistent welding, and a carbide interchangeable tip on the horn. The adjustable height of the horn and anvil increases the seal integrity and reduces puckering. Custom patterned wheels can be made to your specifications (within the limits of the system).